Indian Mango Dal. 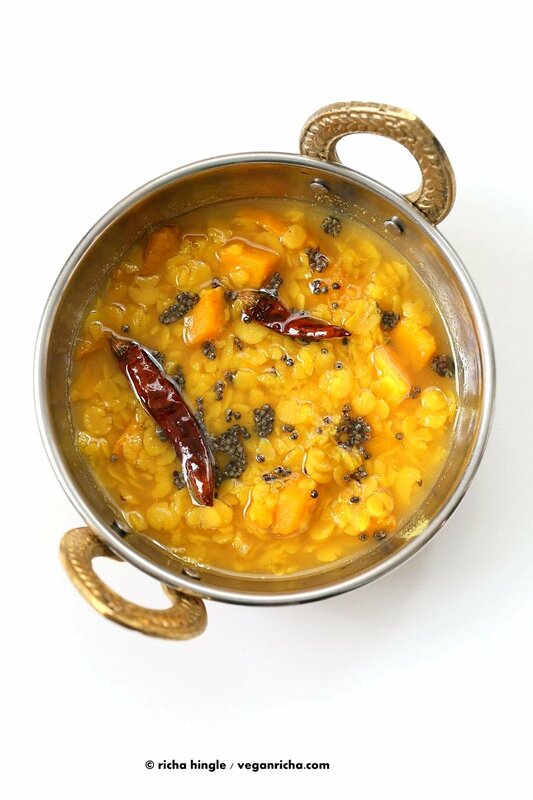 Toor Dal with unripe or ripe mango and 6 ingredients. Easy 1 pot soup or side. Use other lentils or veggies for variation. Vegan Indian Dhal Recipe Gluten-free Soy-free. Pin this post. The first few years of my childhood were spent living in a big joint family home (with extended family). That meant that there would be huge amounts of food made and the menu was dependent on the elders’s preferences, which always a Punjabi style spread with the works (bean curries, veggie sides, creamy sauces, all with complex set of spices, heat, cream etc – heavy vegetarian Indian food). The food was filling, which obviously it needed to be for the young men and women who were going to be working all day. Some days, we children would want some simple food and would sneak into one of our neighbor’s house to eat dal chawal. Yep, I remember wanting just plain toor dal and a light meal. It has this alluring flavor profile which is very different. This Toor dal (split Pigeon pea) recipe is just that, very simple and amazingly tasty. You can made the dal with or without the mango. Add other veggies or fruits if you like like apples or squash, use other lentils like red lentils(less cook time) or chana dal (longer cook time). Add the mango or veggie earlier if you like them cooked through. I slurped up most of the dal as soup and served the rest with some Bengali Veggies . I always wonder about how to present Indian food in the photographs, so that it looks more approachable. Indian food in Indian style serving kadhai bowls, or served as a meal bowl. Dal Bowl above served with the Bengali Veggies and Turmeric lemon rice. Add some coconut chutney from my book. That is one sunny turmeric bowl. In general, everyday Indian food is served on a small thali (plate) with small bowls filled with individual items like dal, veggie side, rice, chutney etc, so one has control over how much of what they want. In a bowl, it becomes a mix of everything (which my Dad would surely frown upon). But bowls are the thing these days. Everything all together in a bowl. What presentation catches your eye and makes you want to cook? Indian Mango Dal. 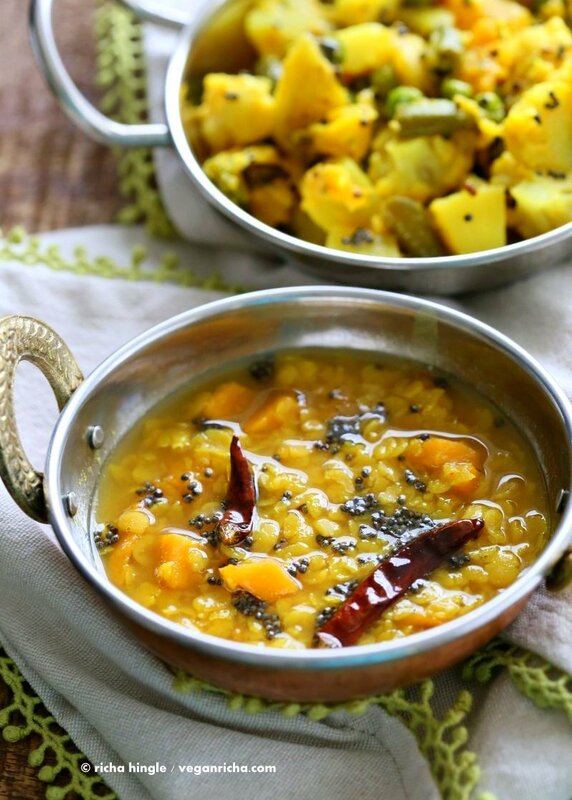 Toor Dal with unripe or ripe mango and 6 ingredients. Easy 1 pot soup or side. Use other lentils or veggies for variation. 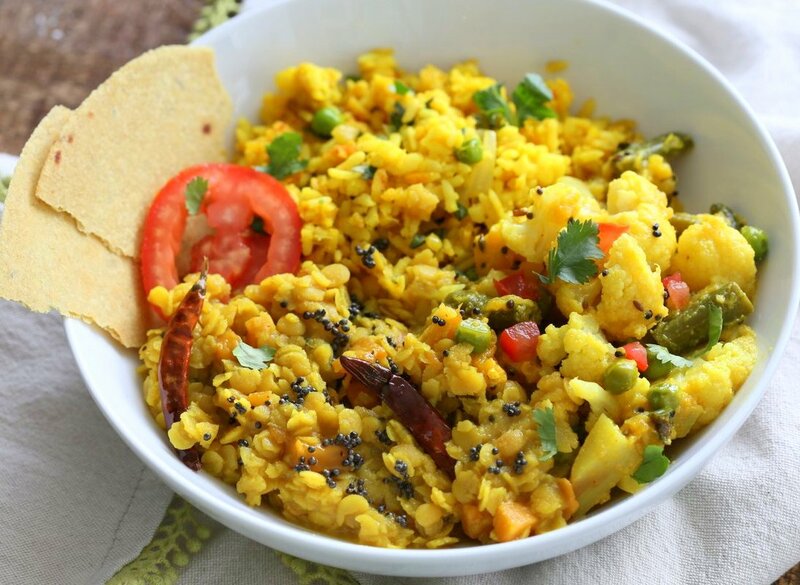 Vegan Indian Dhal Recipe Gluten-free Soy-free. Easily doubled or halved. Wash and soak the split peas for half an hour. Drain, add to a deep saucepan with water. Partially cover and cook over medium heat for 25 to 30 minutes or until tender to preference. Add in the salt and mango and cook for 5 minutes. At this point you can also add some chopped tomato. Reduce heat to low and continue to simmer over low heat while you make the tempering. Mustard seeds in the tempering add a salty flavor profile, so start with less salt. Make the tempering: Heat oil in small skillet. When the oil is hot, add mustard seeds and let them start to pop. Use a lid if the popping gets too exuberant. Add dried red chilies and cook for a few seconds. At this point, you can also add in in some fresh or frozen curry leaves. Add this tempering to the simmering dal. Mix in and take off heat. Taste and adjust salt and heat. Add in spice blend like garam masala or kolhapuri masala or sambhar masala for more flavor. Serve with an Indian meal with a veggie dry side (subzi), rice or flatbread, or serve as a soup with a dash of lemon and crackers or pita bread. 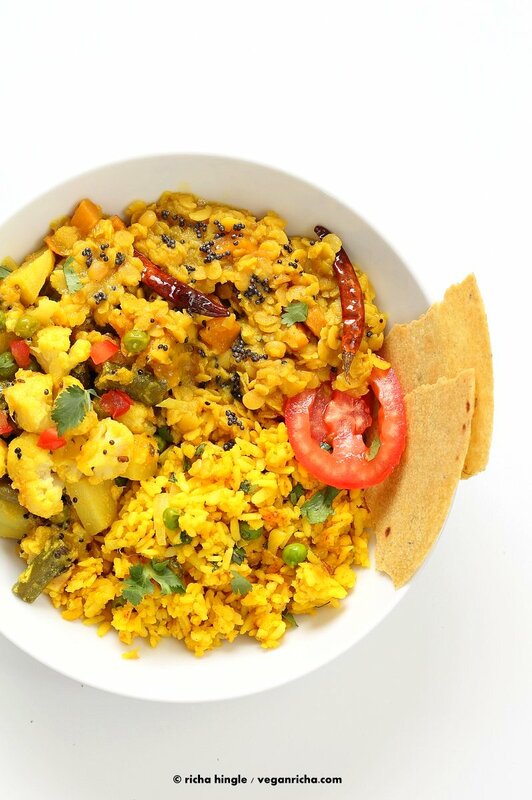 Served in the pictures with panch phoron Bengali Veggies and lemon turmeric rice. Cooking time depends on several factors as the age of the split peas and the kind of split peas/lentils. Red lentils will cook in 15 minutes. Fresh toor dal (that has been soaked) will cook in 25-30 minutes. Split peas or Chana dal will cook anywhere from 30 to 45 mins or longer. And while you are here, check out this fabulous video review of my Book by Mary’s Test Kitchen. Almost 1 year since release! I love meals ‘in a bowl’ and the first picture here made me really want to make this. I love the concept of thali but a rectangular plate is not as appealing as a bowl. I guess round is my thing. Ever seen a round thali? Just spent two months in Bangalore and discovered south India dishes I’d never heard of. Love Indian food. Thanks! Our Thalis are round, filled with round small bowls. Both shapes are used though. Yes, South Indian food is very diverse, but is not as extensively available in the US as North Indian food. Because of that the spices and ingredients needed for South Indian cuisine are also not that easily available compared to the North Indian ingredients, most of which can be found in regular grocery stores. I already LOVE Indian food, so this is amazing–the addition with tropical flavors such as mango and red chiles would taste great! I think 4 chilis was waayyyy too spicy for me. I had never used them, it was very nice but ended up so spicy that i can’t finish eating :,( so i will only use one chili next time or maybe just curry and no chilis. Try mild dried chiles like California Red and don’t break them. Once broken the chiles keep leaking the heat into the dish as it sits. The chiles I use are small in size and i often use upto 10. sometimes there is that one super hot chile which ends up making the whole dish too hot, most other times they add more smoky flavor profile. I like the photo of the mango dal by itself in the kadhai bowl. In that one I can fully distinguish the mango which is what first drew me into wanting to make the recipe. The suggestions of what to serve it with, and that it could be served “bowl style” are helpful though. Is there a recipe somewhere on your site or in your book for the delicious sounding Turmeric Lemon Rice? Thanks! It’s a simple rice with mustard seeds, turmeric and lemon juice. I might put it up in a few days. Hi Richa! 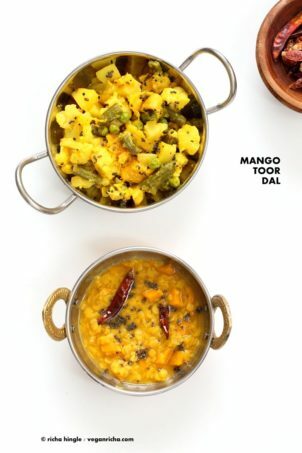 Quick question related to the serving size of the Mango dal. The total recipe serves 4. For the nutrition information, your break down the information per serving. Does per serving = 1 cup? Thank you. 1 serving is 1 serve of 4 serves. so if the recipe makes 2 cups, then its 1/2 cup per serve.